Emma is playing a new mobile game involving n clouds numbered from 0 to n - 1. 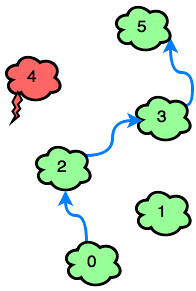 A player initially starts out on cloud c0, and they must jump to cloud cn-1. In each step, she can jump from any cloud to cloud or cloud . There are two types of clouds, ordinary clouds and thunderclouds. 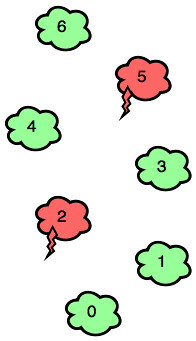 The game ends if Emma jumps onto a thundercloud, but if she reaches the last cloud (i.e., cn-1), she wins the game! Can you find the minimum number of jumps Emma must make to win the game? It is guaranteed that clouds c0 and cn-1 are ordinary-clouds and it is always possible to win the game. The first line contains an integer, n (the total number of clouds). 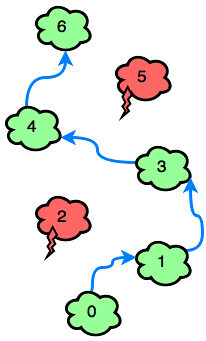 The second line contains n space-separated binary integers describing clouds c0, c1, c2,..., cn-1. If ci = 0, the ith cloud is an ordinary cloud. If ci = 1, the ith cloud is a thundercloud. // break out of infinite loop.